I am a Potter, Experimental Archaeologist and Ancient Pottery Technology Specialist, based in Rothbury, North Northumberland. I offer; media presntation, demonstrations, workshops, talks, lectures, replicas, reconstructions and museum displays and travel throughout the United Kingdom. I specialise in Prehistoric, Roman, Anglo-Saxon, Mediaeval and Post Mediaeval pottery of Britain and Ireland but can also cover Ancient Greek and Egyptian pottery. Ancient pots in museum cases can appear quite boring, I know that they're not! They are filled with clues about the lives of the craftspeople that created them and the people who used them. In my Demonstrations and Workshops, Based on Archaeological Evidence, I bring them to life, recreating the processes that went into their manufacture, and the part that they played in peoples' lives. Specialist areas include: Neolithic, Chalcolithic, Bronze Age, Iron Age, Romano British, and Anglian. My pottery workshops are fun and educational, ranging from Neolithic and Bronze-Age pot making, Roman wheel and mould made pottery to Saxon kiln building. Several workshops are specifically designed for school groups from Primary School to Sixth Form. No previous experience is needed and groups of mixed ability can work together. Projects can be tailored to any age group from lifelong learners to primary school children but one thing is guaranteed, they will be fun. For those working towards a formal qualification, courses can be pitched at a more academic level. Sessions can consist of a mixture of demonstration and hands-on workshop. Demonstrations can be tailored to any age group and can be presented as an illustrated lecture, for those with a more academic level of interest or those working towards a formal qualification. Sessions can consist of a mixture of demonstration and hands-on workshop. These can be presented to a single group booked in for the full session or can be presented to passing crowds or drop in groups as part of a larger event. 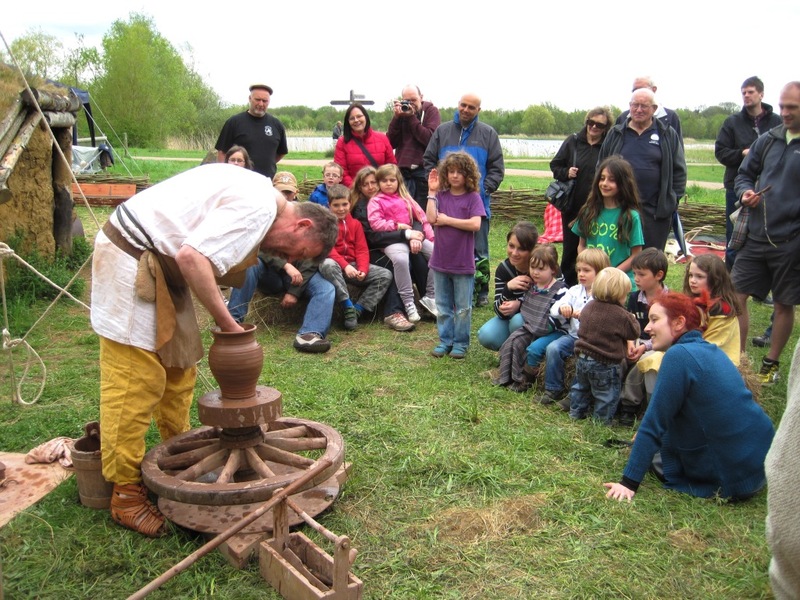 Ancient pottery workshops are ideal for living history and heritage events but have been presented very successfully at country fairs and charity events. When I handle an ancient pot it's a little like shaking hands with the original potter; a handshake across thousands of years. I can feel the impressions made by their thumbs, the pressure of their fingers pushing the wet clay into the palm of the hand to swell out the belly of the pot, the sweep of a tool to decorate the surface. All of these movements are like frozen, or possibly more correctly, fired moments in time, preserved and waiting for me to decode. When I come to emulate their actions and re-create one of these prehistoric masterpieces, I get to know the potter a little better. A conversation takes place … "Oh I see why you did that" …. "What did you use to make that mark?"......... "Now that's clever, decorating it like that". The conversation may seem a little one sided but the answers come back to me from the clay. Above all the act of making a piece gives me a deep sense of respect for a fellow craftsperson. From hand tools and potters' wheels to kilns and pottery workshops I can build reconstructions for experimental archaeology and museum display. 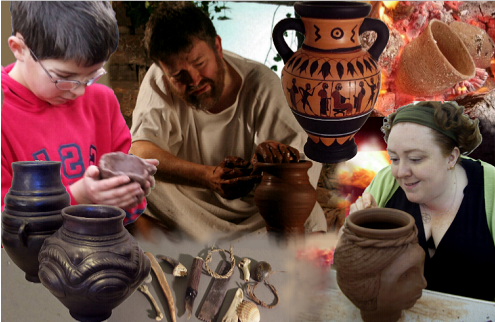 My historical pottery workshops for schools cover all ages from reception to sixth form. All of my workshops include: A demonstration of pot making; A handling collection; Discussion of how pots were made and used; A hands-on element which gives the children something to keep from the day's work. I have variety of workshops and projects prepared and "ready to go" but if you have any specific requirements please contact me to discuss your needs.